A magazine photograph became the challenge for our small group. Instructions were to choose any part of the color, shape, line or composition and make a 16x20 art piece. 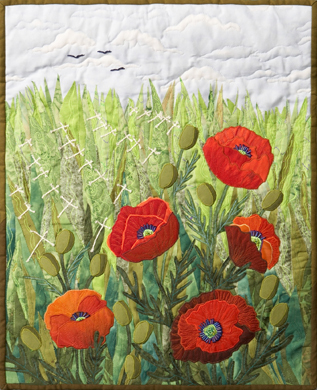 My choice of the red poppies includes the crossings on the left and the entire poem by John McCrae on the reverse of the quilt. Fusing, raw-edge applique, embroidery, couching, beading, fluorescent threads complete this art piece.